A great first group dance song at a wedding reception can set the tone for the partying for the rest of the event. This photo of the couple dancing in the middle of their adoring guests shows the energy that can be created when you get everyone involved early. The couple had a choreographed First Dance that busted out from a regular slow dance song at the start. It was a high-energy number after that, full of cheeky dance moves that riled up the crowd. Before the song was over though they waved all their guests onto the dance floor, which completely energized the guests. This eases the transition between the first dances and the regular dancing, as people can have a hard time getting off their bottoms after a big dinner. 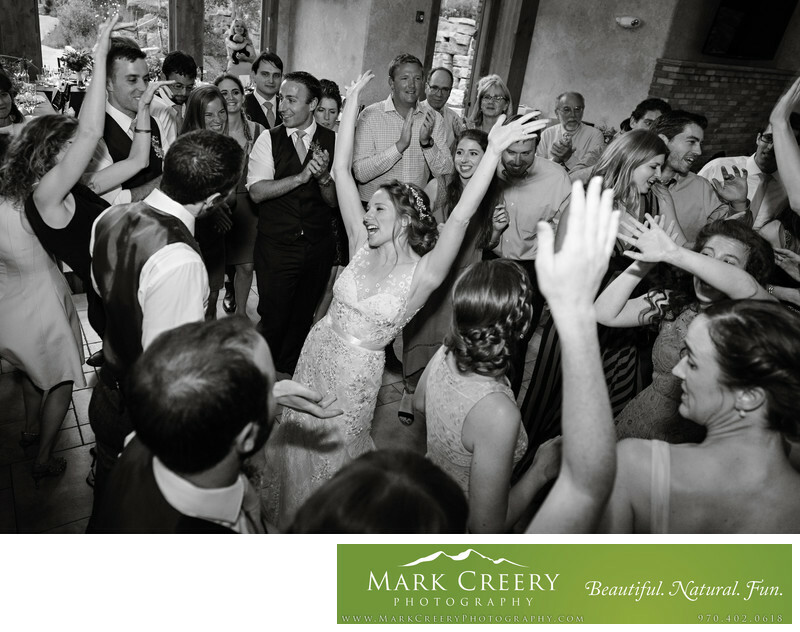 Cheyenne Mountain Resort has an idyllic location for a wedding ceremony and reception, with many photography options. It has a large lake to make for a pretty backdrop, and over 200 acres to explore. For outdoor venues, there is The Beach with its white sandy beach and mountain backdrop, The Chipping Green on the golf course with lush green grass, Grand Rivers Terrace with sweeping views of the Rockies and up to 200 guest capacity, Quail Terrace with similar views but up to 60 people or less, Cheyenne Courtyard, which can be either an outdoor reception or ceremony for up to 200, and the Pavilion. The indoor venues are all elegant options - the Remington Room, Colorado Ballroom, Centennial Ballroom, Grand Rivers Ballroom, and Cheyenne Ballroom. Cheyenne Mountain Resort is located in Colorado Springs, Colorado. Contact: (719) 538-4000. Location: 3225 Broadmoor Valley Rd, Colorado Springs, CO 80906.